Srinagar, March 25: National Conference (NC) president Farooq Abdullah reached the DC office in Srinagar on Monday along with son and vice president of the National Conference Omar Abdullah and filed his nomination papers for the upcoming Lok Sabha 2019 Elections. Farooq Abdullah Pitches for Early Polls in Jammu and Kashmir. Other than Omar, Farooq Abdullah was also accompanied by party General Secretary Ali Muhammad Sagar. Farooq Abdullah filed papers for Srinagar parliamentary seat, which will go to the polls on April 18. 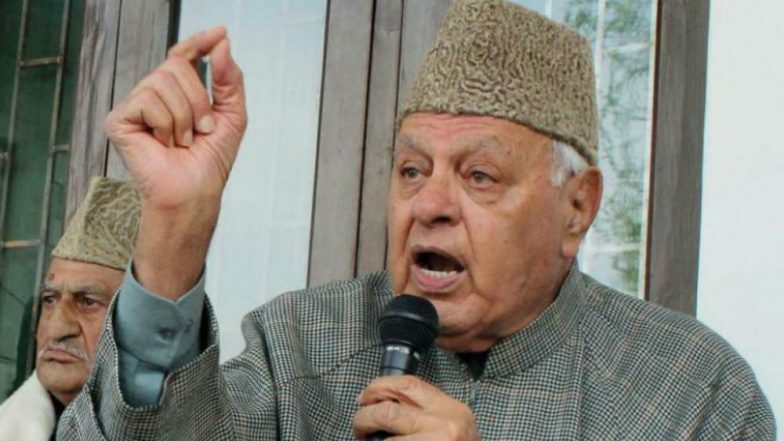 Farooq Abdullah Hits out at Centre, Governor Admin over Administrative Hq in Leh. The National Congress (NC) and the Indian National Congress (INC) have formed an alliance for the upcoming Lok Sabha election. The Congress, as part of the alliance, has not nominated any candidate from Srinagar seat. The Srinagar Lok Sabha seat is spread over three districts of Srinagar, Budgam and Ganderbal. It has 12,90,318 voters who will cast their votes at 1,716 polling stations set up in the constituency.